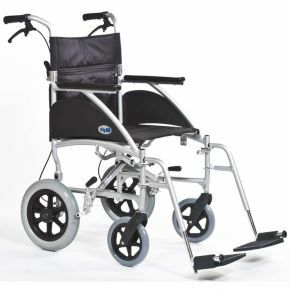 The Swift Lightweight Transit Wheelchair is made from strong but light aluminium but doesn't compromise on comfort or functionality. It has both attendant and user brakes, puncture-proof tyres, and a good level of padding too. The clean, compact profile that means it is great for indoor use when spaces are confined. Smaller users can benefit from a smaller seat size too, making the chair even more manoeuvrable. A Swift Transit Wheelchair also folds down for easy transport or storage. A great little chair, lightweight yet well made. Very happy with our purchase.